National Budget for the year is about to be announced soon and before that Government of Pakistan has released an Economic Survey which will tell about the targets achieved by our government. According to media reports government failed to achieve those targets and growth rate was not achieved as per it was set to be. The economic growth this year for Pakistan was 4.2 percent while the target was 5.1 percent, according to a copy of the Economic Survey for 2014-15. The report goes on to say that floods, dharnas (rallies, sit-ins, protests), and law and order situation affected the growth rate. 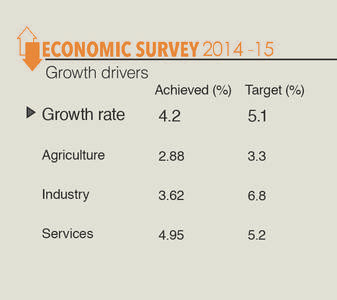 Agricultural development was at 2.9 percent for the fiscal year 2014/15, as compared to the set target of 3.3 percent. 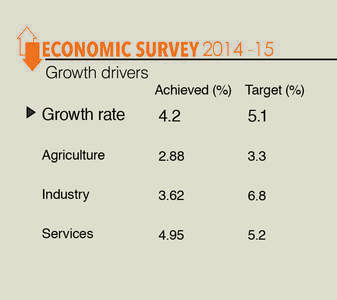 The Economic Survey is an important document which highlights performance of different sectors of the economy. As per survey reveals, many sectors were rated under its performance level, the current political situation and natural calamities being the reason for. The Survey covers development of all the important sectors of economy, including growth and investment, agriculture, manufacturing, mining, fiscal development, money and credit, capital markets and inflation and debt and liabilities. According to the official documents, the agriculture sector grew by only 2.9 per cent during outgoing financial year, far below the target of 5 per cent. Finance minister of Pakistan Ishaq Dar revealed that the set target was 5.1% but it has wide margin which is missed. Pakistan is the second largest economy in South Asia which lags with 4% while other countries have it by 7% in last five years. Dar said that inflation has fallen a little bit as compared to past, attributed towards the cheaper oil prices.Despite the sharp fall, Pakistan’s average inflation in the past five years is slightly higher than the regional (South Asian) average.